Stop the world, I want to observe! Earth rotates on its axis at a rate of about one revolution every 24 hours or so, and so celestial objects appear to move across the sky in an arc as the Earth turns. The Equatorial Mount permits one to move a telescope in the opposite direction from that which the Earth is rotating, and with a drive it can move at the same apparent speed as that of the Celestial objects. Telescope drive systems are sometimes referred to as a "Clock Drive" since the earliest mechanical drives were weight driven clock mechanisms modified to rotate only once every 24 hours. Right: Click image if you wish to see an animated movie of the Earth Rotating. This is a Quicktime presentation courtesy of NASA, and so your Web Browser should be enabled to view it (3,491,793 bytes). The equatorial mounts made by Vixen are among the few well made platforms with gear sets that can be turned by hand. And so once the mount is "Pole Aligned" so that its axis of rotation parallels that of the Earth, it is then a simple matter to turn one hand knob causing the mount to move in an arc corresponding to the motion of objects overhead. However many observers find that having to constantly turn a knob to stay on target is distracting. So Vixen has engineered their Super Polaris and Super Polaris DX (both now discontinued), Great Polaris GPE, GP, and GPDX mounts to accept optional drive systems including the SD-1 Single Axis Drive & Corrector, or the DD-1 Dual Axis Drive & Corrector. With this accessory you can walk away from the telescope and come back later to find the telescope still on the target. A drive makes it easier to share the telescope with others during an observing session. And it is possible to start into astrophotography; we have numerous photos on Company Seven's showroom walls taken by our customers with this equipment. For an observer located in the northern hemisphere celestial objects rise in the eastern horizon, gradually moving in an arc up and right across the sky towards the South, and then continue moving to the right and down towards the western horizon. For those persons "down under" in the southern hemisphere, the motion turns the telescope in the opposite direction. And so the SD-1 and DD-1 provide a switch to permit the operator to select either a clockwise or counter clockwise motion. Vixen also offer a retrofittable "Go To" computer control system, the "SkySensor 2000". The original SkySensor introduced in its first form in 1984, was the first commercially viable "Go To" open loop computer control system for amateur telescopes. Now the SkySensor 2000 and SkySensor 2000 PC are the vastly refined and improved successor however, the PC version is not sold in the USA. Controls right ascension motor drive on GP, GP-DX, GP-E, SP and SP-DX equatorial mounts. Features 2x guiding, 16x fast forward and reverse slewing, and pause. Runs on six C batteries (not included). Includes cable and battery case. MT-1 motor sold separately. Power Input: 6.5 to 12 Volt D.C. Provided DC Power cord with Cigarette Lighter Male Plug not shown (33,334 bytes). Controls both the right ascension and declination motors for GP, GP-DX, GP-E, SP and SP-DX equatorial mounts. Features 1.5x and 2x guiding speeds, 32x fast forward and reverse slewing, and pause. The fine guiding motion is buttery smooth. If you are not certain whether or not you wish to buy a single or dual axis controller then we recommend buying the DD-1 since it is possible to buy the DD-1 now with one motor and use the DD-1 as a single axis (Right Ascension) controller, and later on you may buy the second MT-1 if you find yourself needing control of the second (Declination) axis. Runs on eight D batteries (not included). Includes cables and battery case. MT-1 motors sold separately. Power Input: 7.5 to 12 Volt D.C. Provided DC Power cord with Cigarette Lighter Male Plug not shown (73,787 bytes). 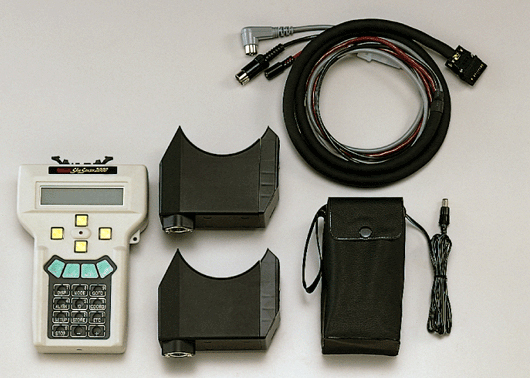 The SkySensor "Go To" control system was introduced in its first form in 1984; this was the first commercially viable "Go To" and tracking computer control system made for amateur telescopes. It was distributed for use as an operator retrofitable controller and motor set for installation onto the "Super Polaris" series German equatorial mounts which have since been discontinued. This SkySensor systems are all an "open loop" arrangement where assuming they are set up and then indexed to the night sky properly, the SkySensor CPU (central processing unit) calculates where the mount is pointing the telescope and how to move it from point to point. There is no positional feedback from the mount to the CPU and so if one releases the mount clutches and moves the telescope by hand, then the SkySensor will not know this. The open loop arrangement is typically the arrangement which is provided today on most moderate to mid priced amateur "Go To" telescopes; assuming no one accidentally moves the telescope by hand after a CPU is indexed then this can work with a reasonable degree of accuracy for most amateur telescopes. 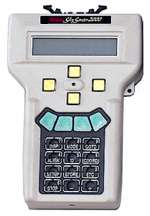 Keypad Hand Held Controller with LCD display shown (31,356 bytes). The current model "SkySensor 2000" and the "SkySensor 2000 PC" systems are the vastly refined and improved successors. SkySensor 2000 is the same operating system as is now provided with the Vixen Atlux series mounts. The SkySensor 2000 is retrofitable, it can be installed by the user for use with the Vixen GP, GP-DX, GP-E, SP or SP-DX equatorial mounts to provide highly accurate "Go To" pointing and tracking of celestial objects in its database including the planets, Moon, Sun, and thousands of other objects from Messier, NGC, IC, UGC, SAO, GCVS catalogs. This is an easy system to setup and to operate, Polar alignment does not really have to be done for visual uses although we do recommend operators do so for astrophotography. This is the most accurate of the tracking control systems made by Vixen for the GP series mounts since it also incorporates PEC (Periodic Error Correction) circuitry to reduce the amplitude of worm gear periodic errors. It is quite refined, after all Vixen has had twenty years to perfect it - even the effect of atmospheric refraction is automatically corrected so even when searching for objects closer to the horizon the pointing accuracy is good. Users continually praise the accuracy and ease of use of this device. As s noted in the "Sky & Telescope" magazine review of April 2000, p. 56-61 Far outweighing any criticisms is the overriding fact that Sky Sensor worked reliably. The hardware is well made and the software is robust - never once did I have the hand controller freeze up, crash, or display cryptic error messages. For the most part, I found Sky Sensor remarkably frustration-free...Vixen has produced a strong contender in the Go To sweepstakes. The SkySensor 2000 differs from the SkySensor 2000 PC in that the basic model does not provide the RS-232 port. This means the SkySensor 2000 can not link to a personal computer, or to a number of other third party devices. The SkySensor 2000 can not be controlled remotely. The SkySensor 2000 PC model is not sold in the USA since it has not been certified to operate within RFI emission standards set forth by the US Federal Communications Commission (FCC). However, the SkySensor 2000 PC model may be available in Europe selling for more than double the cost of the standard SkySensor 2000 in the USA. SkySensor 2000 can be a cost effective solution for those who already own a suitable Vixen mount. However, we at Company Seven feel this system has enough limitations by current "Go To" mount standards that we would encourage one who is buying a new mount to consider one such as the well integrated SPHINX SXW system especially since there are now ASCOM modules that permit the SPHINX to communicate with a broad range of optional third party accessories (CCD Cameras, Robotic Focusers, etc.). The SkySensor 2000 is autoguider compatible and it also provides programmable "Periodic Error Correction" circuitry to improve tracking, this is particularly beneficial for astrographic applications. Includes Keypad Hand Controller, two Model MT-4 motors, cabling and battery case. 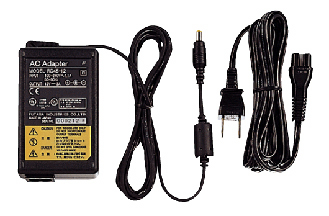 Optional rechargeable 12 volt power supply with proper polarity cable, or Vixen AM-AC-2537 AC Adapter is recommended. This motor drive incorporates a stepping motor and brass drive shaft with spur gear which are regulated by a very accurate quartz oscillator. Their circuits are designed to keep tracking error within 0.005% of sidereal time. The cast aluminum housing with dovetail track attaches readily onto GP type mounts. The MT-1 can also be adapted for use on the now discontinued Vixen SP type mounts, please ask to see our tech note for SP mounts on Mount Accessories. One motor is required for each axis driven. If you order the mount from Company Seven then we will install this for you. 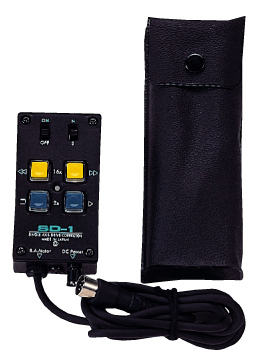 For use with optional SD-1 controller, one MT-1 is required. For use with DD-1 then two MT-1 are required. right: MT-1 Stepper Motor Assembly (15,093 bytes). The dovetail bracket is at the bottom, opening for the drive shaft and brass Spur Gear disc (not shown) at right. Each of the two axes of a telescope equatorial mount will incorporate some clutch mechanism on each axis so that one may compensate for minor imbalances of payload, and engage the geared tracking mechanisms. These clutches must be tightened to permit the provided gear sets to turn the telescope. These provided mount Declination and Right Ascension clutches should not be confused with the optional P/N 3828 Motor Clutch Assembly. Above right: drawing of Motor Clutch Assembly components (11,366 bytes). 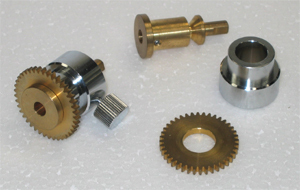 The Vixen SP and GP series mounts are provided with Hand Knobs that attach directly onto the Worm Gear shaft of each axis on these mounts; this permits manual fine positioning and tracking of the mount. With the optional MT-1 or MT-4 Motor installed the drive shaft of the motor is coupled directly to the Worm Gear of the Mount. Without some clutch, one would lose the hand controlled capability to make coarse adjustments of the telescope position. The P/N 3828 Motor Clutch Assembly mechanism provides the capability for manual operation of the Right Ascension or the Declination axes with motor drives attached. Left: two Motor Clutch sets, one assembled left with components at right (43,611 bytes). If you order the mount from Company Seven then we will install this for you. As a retrofit, remove the Slow Motion control Hand Knob from the Worm Gear Shaft. Slip the brass Motor Clutch Gear Shaft into place over the Worm Gear Hub and tighten its set screw so that it now acts as an extension of the Worm Gear. Slip the brass Spur Gear disc over the Clutch Gear Shaft and mesh it with the Spur Gear attached on the adjacent MT-1 motor. The Slow Motion control Hand Knob is then installed onto the Gear Shaft. When the Clutch Thumbscrew is properly adjusted (a skill learned quickly) then the Clutch Ring is drawn down upon the Spur Gear putting pressure on the meshing Spur so that as the motor is turning the Worm Gear shaft, the motor can be overridden by the hand control too. And when the hand control is released, then the motor can resume tracking. Includes Futaba Industries Model AC45-12 Power Supply, and US standard AC power cord, with cord and male plug for Vixen products. 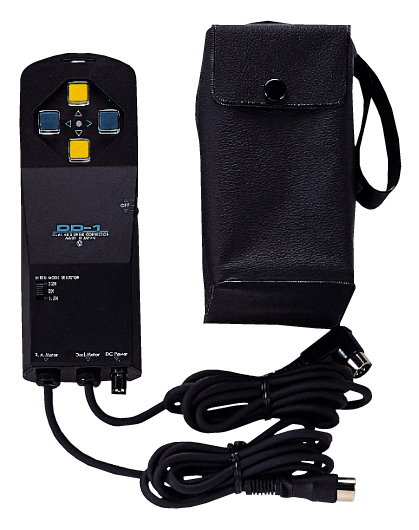 Power Supply plugs into wall current to provide 12 volt DC current for use with the Sky Sensor 2000, and DD-1 controllers. This is not recommended for the SD-1 controller. When operating from AC outlets Company Seven recommends the outlet be a "GFCI" (ground fault circuit interrupt) model to reduce risk of shock. 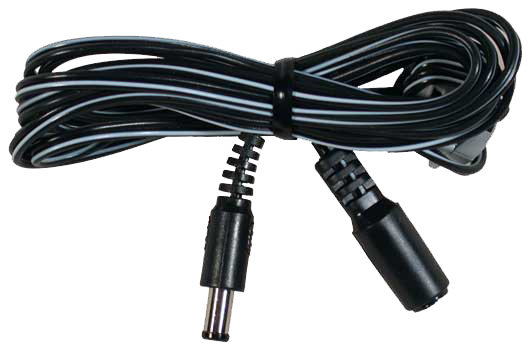 For use with the SPHINX Starbook also order the P/N AM-AC-2537 Tip Adapter (described below). right: Vixen AC Power Adapter Kit with the Power Supply at left, AC Power Cord at right. (48,660 bytes). Converts tip of Vixen P/N AM-AC-3599 12 volt 3 amp AC adapter (described above) to work with SPHINX mounts. Will also work for any tip negative "M-plug". right: Vixen AC Adapter Sphinx Plug (16,231 bytes).